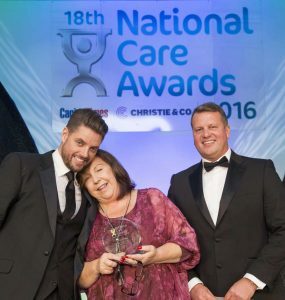 The New Deanery and St Mary’s Court residential care homes near Braintree are celebrating having won two prestigious National Care Awards at a glittering ceremony in London. Home Manager at The New Deanery, Jane Sadowski scooped the top award in the Care Leadership 2016 category and Head of Housekeeping Ieva Bagurske was named as CareHousekeeper 2016, on 25 November at Hilton London Metropole. Ieva said: “To win this big award was truly fantastic, and for a split-second I didn’t believe it. I feel so proud and lucky to have received it. I would like to thank all the residents, team members and directors for supporting me through this journey, and this award belongs to all of us. Home Manager of The New Deanery Jane Sadowski was also awarded for her dedication at the care home near Braintree. Jane said: “Whilst I am thrilled to receive this award, the great care and service at The New Deanery is most definitely a whole team effort. To enquire about accommodation and respite care at The New Deanery or St Mary’s Court, please call 01376 328600 for St Mary’s Court or 01376 328600 for The New Deanery. Or visit www.thenewdeanery.co.uk or www.stmaryscourt.co.uk for more information.